"Regardless of how you dress your wings, the key to making amazing wings is to fry them twice. I love them tossed in the dry seasoning rub listed below, since they maintain their crunchy flavor! I never understood those who chose to oven-bake their wings; it's called a guilty pleasure for a reason! You can also season the wings with an Asian soy, BBQ, herb or traditional buffalo-style hot sauce. Serve immediately along side celery and ranch or blue cheese dressing, if desired!" Mix paprika, black pepper, chili powder, seasoned salt, cayenne pepper, onion powder, garlic powder, white pepper, and mustard powder together in a bowl until seasoning mix is evenly combined. Dry chicken wings thoroughly with a paper towel. Heat enough vegetable oil and peanut oil in a deep cast iron pot or heavy pot to reach a depth of about 2 inches; bring to 300 degrees F (150 degrees C). Split wings into 2 batches and fry each batch in the hot oil, 4 to 5 minutes. Transfer each batch to a paper towel-lined plate to drain. Increase oil temperature to 350 degrees F (175 degrees C). 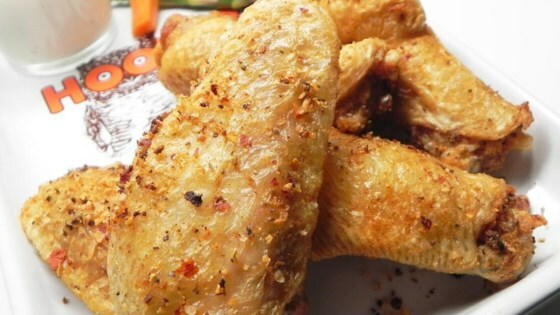 Fry each batch of wings in the hot oil until skin is crispy, golden brown and meat is no longer pink in the center, 5 to 6 minutes. Drain wings on a paper towel-lined plate; transfer to a bowl. Sprinkle seasoning mix over cooked wings and toss to evenly coat.